Stephanie Chen pushes herself during the showstopper bake and creates three different types of mousse for her Blackberry, Coffee and Pistachio Mousse cake recipe. 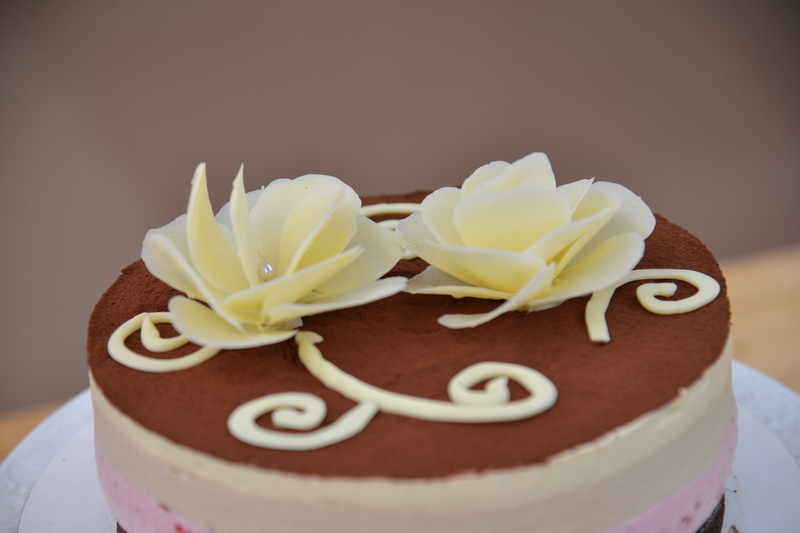 He coffee mousse is flavored with expresso and the cake is topped with a white chocolate flower. The judges' question if all these flavors will pair well with one another. Watch the full episode of " Chocolate Week" from Season 2 Episode 5 of The Great American Baking Show to see if she pushed herself just enough or too far. 1. Preheat oven to 350F. Spray 8" spring form pan and line with an 8-inch parchment paper. Wrap the pan twice with foil on the bottom and roasting pan. Prepare boiling water for bath. 2. Separate 3 eggs. Place yolks in one bowl and egg whites in a stand mixer bowl fitted with a whisk attachment. 3. On a double boiler, melt chocolate and remove from heat. Add softened butter and then let cool slightly. Add in yolks one at a time and stir well. Add in cocoa powder, espresso powder and salt. 4. Whip egg whites until nice and foamy and add cream of tartar. Then add in sugar little at a time when you see soft peaks. 5. Fold egg whites into the chocolate mixture with the first 1/3 of the egg whites. Then add the rest. Fold gently. 6. Add batter into the pan then place into water bath in the roasting pan. 7. Bake for 30-40 minutes till the top has formed a crust and middle Is set. Not jiggly anymore. Want to remove before the edges pull away and there is some bounce back when you press the cake. 8. Cool on a wire rack until it comes to room temperature. 1. When cake is cooled, remove edge of spring form. Grab your cake plate, stand, etc (whatever you're assembling on) and flip cake bottom on top. Remove parchment paper. 2. Place spring form back along with acetate plastic around the cake. Place in the freezer while making mousse layers. 3. Layers will from bottom to top: 1. Cake == blackberry mousse == coffee mousse == chocolate ganache. 1. In a cup of ice-cold water, bloom 3 sheets of gelatine for 5 minutes. 2. In ONE mixer bowl fitted with whisk attachment, add 1-cup heavy cream and whip on high until soft peak. Remove and set aside. 3. In a small food processor, puree the blackberry puree and add into a small saucepan. Bring it to a simmer for a few minutes. Strain the seeds from the mixture. Remove some liquid then melt gelatin leaves and mix well. 4. Let blackberry mixture cool in the fridge. 5. In a SECOND mixer bowl fitted with a whisk attachment, start making the Italian meringue. Add egg whites and have the whisk attachment ready to go. 6. In a small saucepan add water and sugar together and heat on medium. Stir sugar together with water then don't touch it once it starts to simmer. Heat mixture to 248 degrees F / 120 degrees C. When temperature is close, turn on the mixer and start whipping the egg whites on high. 7. Once sugar syrup is ready, pour the syrup into the egg whites in a slow steady stream while mixer is still running. 8. Whip until stiff and shiny. Will take a few minutes. 9. Once the bowl is cool to touch. Take out 100 grams of meringue and fold in blackberry puree and then lastly fold in the whipped cream. If the color isn't bright enough, add more blackberry juice. Do not over fold. 10. Place mousse into an open piping bag and pipe onto chilled cake. Make sure there is about 1.5 inches of mousse. Place back into the freezer to chill. 1. Stir 2 egg yolks and sugar until creamy and pale yellow. Add in corn starch and combine till smooth. Slowly add in warm milk until combined and a light yellow liquid mixture. 2. Transfer mixture into a saucepan and cook over a low heat until It boils and thickens. Keep whisking constantly. 3. Add vanilla extract and espresso powder and continue to whisk until smooth. Let this cool completely. 4. Take bloomed gelatin powder dissolve with 2 tablespoons of hot water. 5. Whip up 1 cup of whipping cream until smooth. Add 1/4 to the coffee mixture and mix then add to the remaining whip cream mixture. Add to piping bag and add to the top of the blackberry mousse. 3. Add vanilla extract and pistachio paste and continue to whisk until smooth. Let this cool completely. 5. Whip up 1 cup of whipping cream until smooth. Add 1/4 to the coffee mixture and mix then add to the remaining whip cream mixture. Add to piping bag and add to the top of the espresso mousse. 1. Sprinkle the top of the cake with a thin layer of cocoa powder. Add on tempered chocolate roses once cake is set. 2. Begin by bringing your saucepan filled with water to a rolling boil. Remove from heat and place a kitchen towel on top. 3. Place your bowl filled with chopped chocolate on top. Let it stand a couple minutes so the chocolate can begin to melt. Keep stirring until chocolate has melted. Do NOT exceed 113 F for white chocolate. 4. Slowly add in unmelted chocolate with a kitchen thermometer. Stir continuously. Trying to reach the temperature of 79F for white chocolate. 5. Now need to raise the temperature BACK UP on the pot. White chocolate needs to be at 82-83F in order to work with it. 6. To raise the temperature of the chocolate, simply re-boil the water on the stove (while keeping your chocolate away from it, of course). Once at a full boil, remove water from the stove, place kitchen towel over it, and replace bowl with cooled down chocolate over it while carefully watching the temperature so it does NOT exceed working temperature.